i am not one to deprive my children of any holiday activities, but must we be like everyone else and buy those $10-$40 halloween costumes (of the current superhero that they are modeling their lives after) from the store? those types of costumes are just irritating to me! plus, who knows which spiderman you might actually end up taking home, they will all look the same! i know i will be lifting up masks every 15 minutes to be sure i have the right captain america in my wagon! when i was a kid we had to be innovative (mostly because being allowed to trick or treat was always a last minute affair). my sister would be pizza and i would be the pepperoni. or one of us would be dorothy and the other would be todo. and being the church girls we are, one year one of us actually went as tithe/offering and the other went as the storehouse (church). no lie!! see how innovative we were! haha, oh, how i love my parents! if i could only tell you how many times we got asked "what are you guys anyways?!" i am sure you would feel sorry for me! but we didn't mind answering as long as it meant we still got candy! besides, we were proud of our costumes made up from things around the house, even if it meant gluing monopoly money to our clothes! it is a shame my kids won't go for abnormal costumery when out trick-or-treating, so superhero-so-and-so we will be. and i can accept that. thankfully, we have had other chances to dress up and i finally talked them into letting me get creative since it was a smaller event. i call this trick-or-chic: the fancy way to do costumery! these costumes were inspired by a cardboard children's book we have about colors and andy warhol's work "giant panda black and white. yellow lion sitting tight." we have all types of clothing with adorable animals on them and just happened to have some from mini rodini that fit with the story. it was easy to mimic the characters on their faces**. 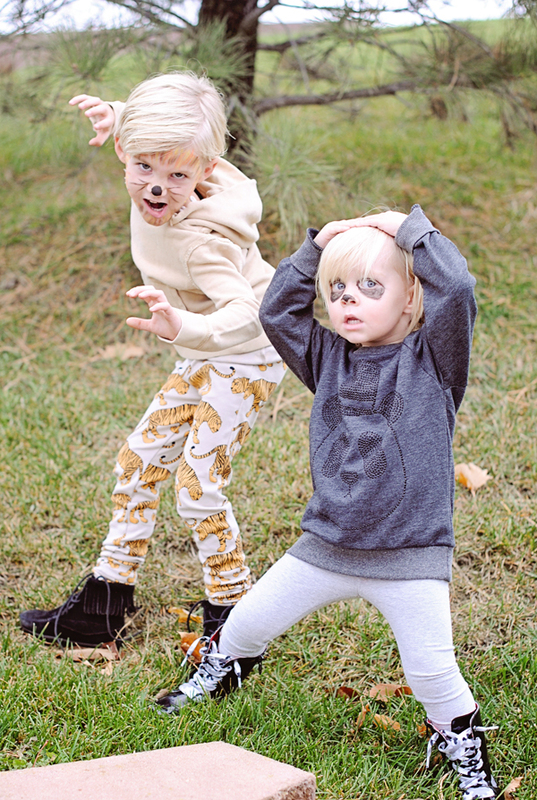 they had such a blast and as you can see they didn't hold back on getting into character and rowan loved pretending to be an animal from one of his favorite baby books! i guess they are more open to change than i thought! so whether you are on a budget or just with me on the fact that sometimes store bought costumes are down right boring, we hope you find that perfect and creative way to express your little one's attitude on this festive day. and bravo if you can do it from things lying around the house! so keep your mind and your eyes open - inspiration can be found in many unexpected places (for us it was a book we read daily). 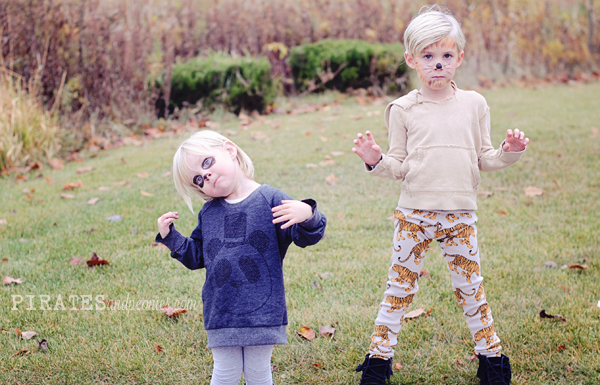 i know it is about the kids, and i am glad mine will be happy with their store bought costumes. and, hey, i even promise to smile and wave to every superhero who is proud of his fake muscles, but i am glad that i got my one chance to use my own ideas! 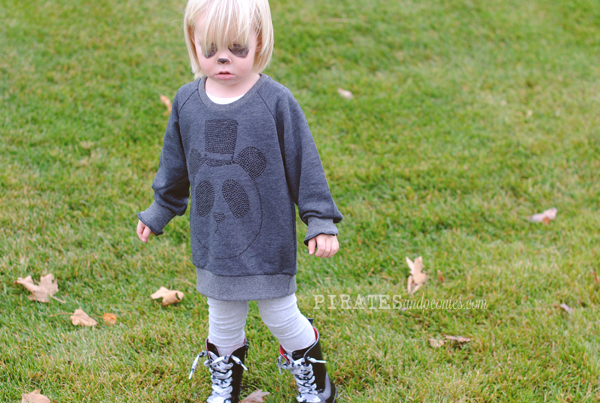 please do fill us in on what your wee one is going as! also, you can share an inspired photo/ idea of halloween-on-the-chic with us on our facebook page here we are always looking for some inspiration! I had a friend who was a lamp in middle school. It was so great!! She wore a lamp shade on her head and had a switch and it was fun. I have always dressed up based on my own outfits really. . . .but never on Halloween. In say September I'd go to school dressed as Madonna from the Lucky Star video, another time I'd dress like a renaissance princess in spring. So while I didn't really create outfits for Halloween, I was always having fun dressing up hehehehe. I love that you were pizza and pepperoni! haha. That's amazing!!! 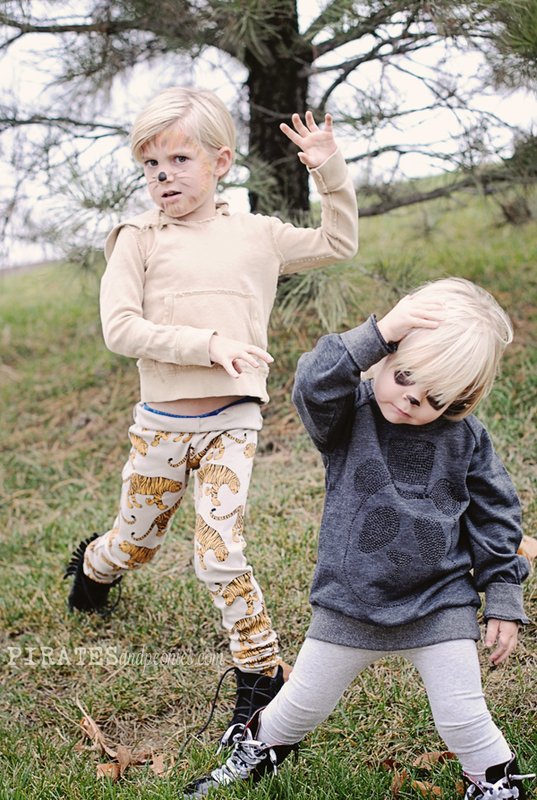 I haven't dressed my boys as anything at all but I am sure if they find an interest, I'd probably do something like you. . .not spend money on something that will be a bit of a waste or that all the other kids are wearing. 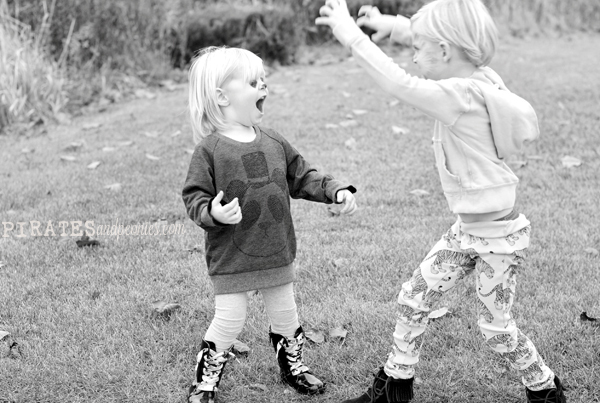 Your kids are adorable with their outfits!!! 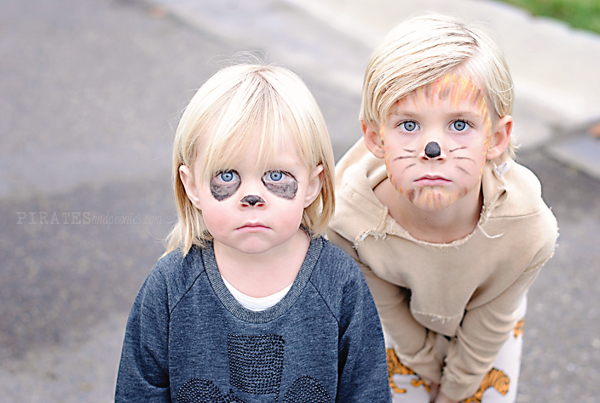 Love how you did the face paint!! cracking up, a LAMP! that is so great! I too never once had a conventional costume. They were always put together /sewn by my mom and as I got older I did it . And now having children , I do the same . My oldest daughter is going as Galadriel, the elf queen from Lord of the Rings . She's 9 yrs old and totally put it together by herself and I think it works quite well ! My 7 yr old is going to be a witch , she loves hers and my 5 yr old is a cheerleader . My 2 yr old son, is going as Clark Kent. Superman jammies, button down shirt and tie work perfect ! All homemade and all happy !! Your boys btw are just as adorable as their costumes ! And super creative on your part might I add ! !